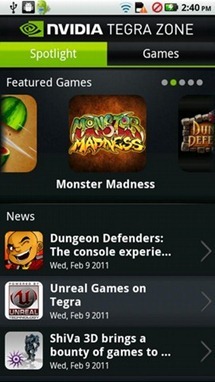 Tegra Zone gives you every Tegra 2-specific game in one place, including all the showcasing one would expect (screenshots, HD videos, etc.). 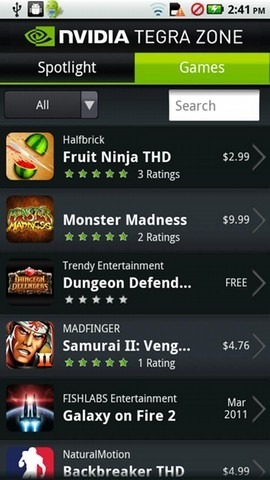 While the app will become more and more useful as time passes (and more Tegra apps and devices hit the streets), there is already a burgeoning library in the making, including: Dungeon Defenders, Samurai 2, and a newly optimized version of Fruit Ninja (dubbed Fruit Ninja THD). Those with a new XOOM, LG Optimus 2X, Atrix 4G, Notion Ink Adam, Viewsonic G-Tab, or other Tegra toys who were hoping to flex their new devices' muscles a little bit can check out the link or QR code below to start your collection.